I’ve already read the English version of the first book in the Southern Reach trilogy but I’m still glad I got a review copy of the German one because I can use it when I need to re-read the book before watching the movie which comes out sometime this year. Also I really like the cover of this edition. While I’m not really interested in Heitz‘ fantasy novels I always enjoy his mystery thrillers so that I was happy to find a review copy of his newest book in my mail. This story is about a cursed card game and the first chapters were already quite promising. You can never listen to enough audiobooks that are narrated by David Nathan so I’m already looking forward to starting this political thriller about a journalist who investigates an attack that killed a CIA agent and almost led to his own death. When I went through my wishlist(s) last month and saw all the older titles on it I made the decision to either get the books I still want to read or throw them off my list. With the new Harry Hole book coming out this fall I thought that I should finally catch up on this series and therefore got the sixth book to read it asap. This book was one of my most anticipated thrillers this year and while I didn’t have it pre-ordered I apparently haven’t been able to resist it for a very long time. I already heard quite a few good things about the book and hope it can live up to my expectations! I’ve been a huge fan of Douglas Preston’s and Lincoln Child’s Agent Pendergast series for many years now but I was always a bit reluctant to start their Gideon Crew series because especially the first book has gotten very mixed reviews. The later books are getting much better ratings though so that I decided it’s worth giving the series a try. I really can’t say that I’m a huge fan of historical fiction (unless it’s historical crime fiction set in the Victorian era) so that I never really wasted a thought on reading one of Rebecca Gablé’s novels. However Yvonne strongly recommended the books AND it’s an audio drama production which are almost always excellent so I’m just going to give it a shot. Like I said above I can’t ever get enough of audiobooks narrated by David Nathan so that I didn’t mind at all that the publisher switched from Simon Jäger to Nathan to read this true crime series by one of Germany’s most famous medical examiners. In fact it was even the main reason to get this second book since I had mixed feelings about the first one. 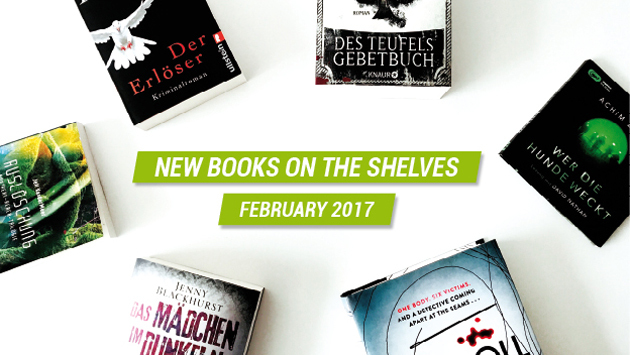 Which books did you get in February? Our list of audiobooks is getting so out of control. We need more hours in the day!